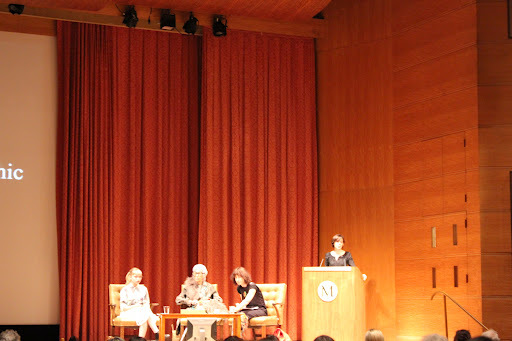 A couple of weeks ago, whilst I was in New York, I was luck enough to go to a talk with the amazing Iris Apfel and Tavi Gevinison called Impossible conversations: Ugly Chic”. 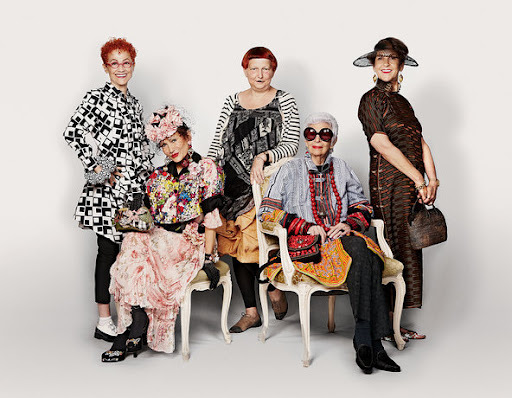 Here are some of the incredibly interesting thoughts on style and how these two women young and old dress. 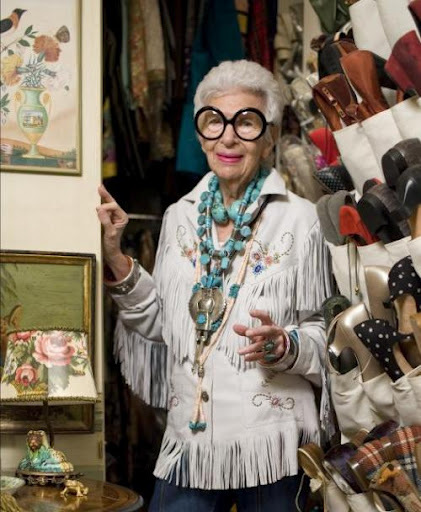 Tavi: ” Taste and style are like a sense of humour. What you find funny is what you find funny. I wish people had more of a sense of humour about style. There is now a more acceptable kind of weird- the vintage, cutsey look”. 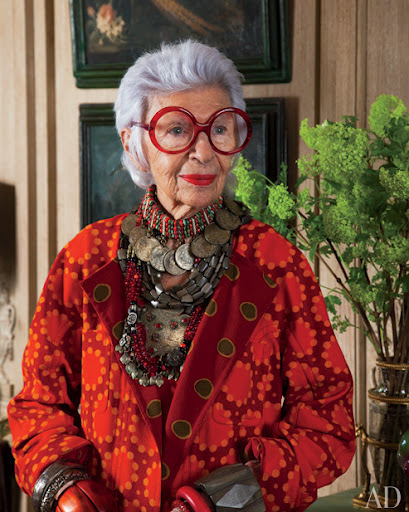 Iris: “Personal style evolves for yourself, and personal style is all about curiosity of oneself. Not give a damn about what anyone else thinks. 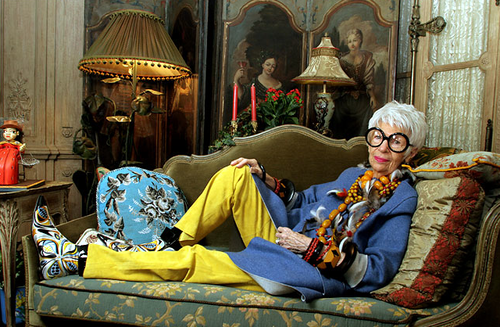 Iris: ‘ In the 40s I was one of the first women to wear jeans. My outfit was a gingham turban, crisp shirt and blue jeans. I had this idea in my head and I HAD to get a pair of jeans. I tried the Army and Navy store and they stated, “ don’t you know that young ladies don’t wear jeans”. Eventually after persistence I managed to get a pair of boys jeans to wear. 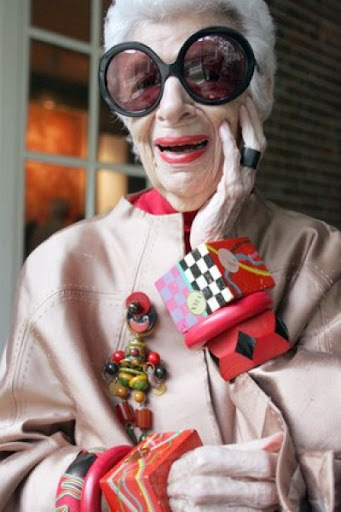 Iris: My favourite designers at the moment are Ralph Rucci and Dries Van Noten. I like architectural clothing that can be embellished with jewellery”. Tavi: My favourite designers are Medham Kirchoff, Rodarte and Prada. Their clothes exist in a vacuum. I like that for Medham Kirchoff music is so important`. I also think Alexander McQueen is important. His was mutant fashion. He was a mad scientist of fashion, but Schiaparelli was the mother of all of this. Iris: “Schiaparelli worked on a womans body. 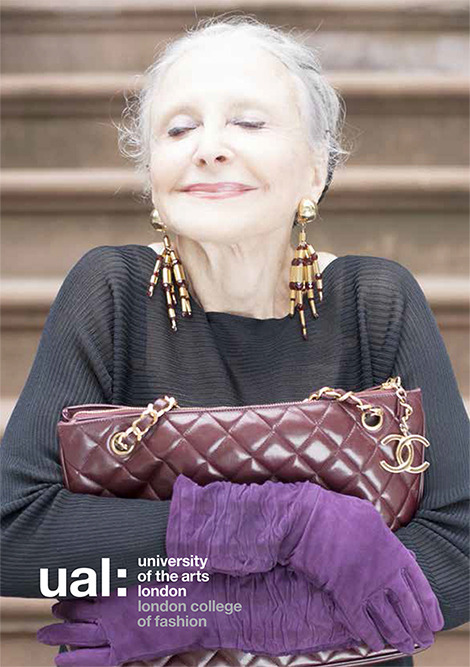 Hers was intellectual rather than just fashion. Her designs were practical and could be worn. Why pay a fortune and look like a freak? Having bumps all over is not the most attractive thought (referencing Comme de Garcons). I can look ugly on my own and it won’t cost me a penny. 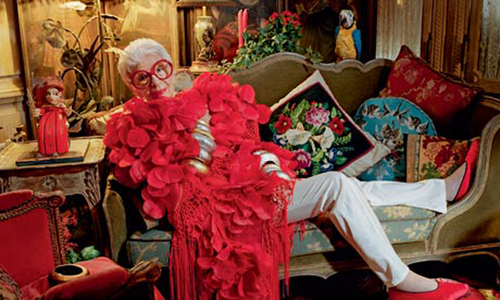 Iris Apfel “ There is nothing like a good old bathrobe” (ahem, my former housemates, if Iris Apfel says this I MUST be cool). 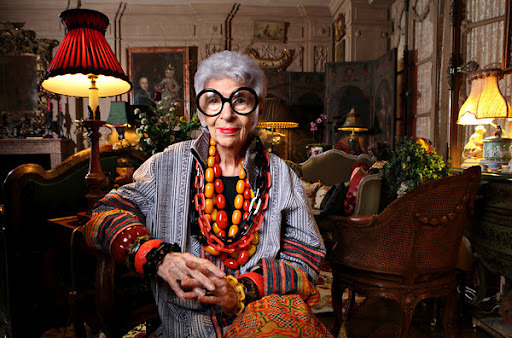 Iris “Clothes should not be the primary thing you do. There is more than clothing to life. You should have curiosity about yourself”. What I think came from this is that there is a hell of a lot of great and creative fashion going on with older ladies at the moment. You just have to look at advanced style to see this (there were a lot of ladies in the audience who have been featured on this website). 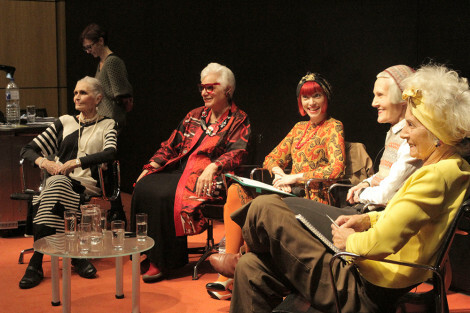 There was discussion at the end of the talk that there might well be an exhibition upcoming for advanced style featuring outfits worn by some of these fabulously stylish older ladies. 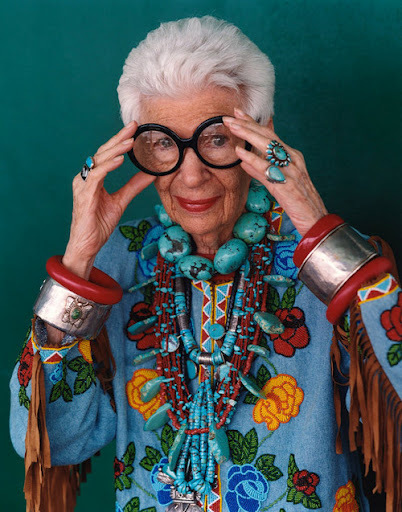 I think both Iris and Tavi made some great points about style and the way we dress. Most importantly dressing should be about self expression and enjoying what you wear. Don’t get driven by trends, and just dress in a way that makes you happy.